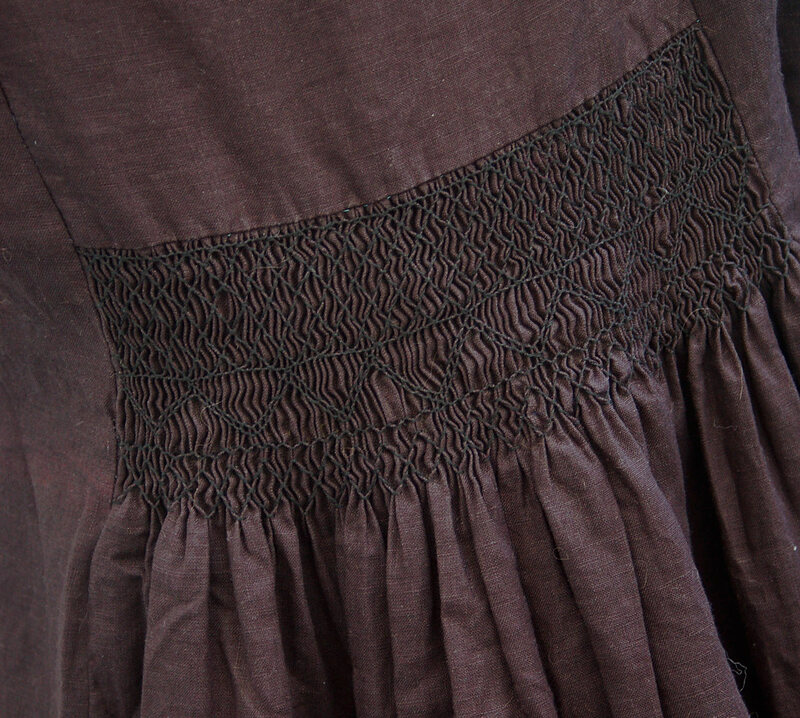 Over on the Oliver + S blog today I posted photos of my first smocking. It was an Oliver + S Badminton Dress for a magazine feature that’s just come out. And since I’ve thinking about smocking I wanted to show you this smocked Lisette Continental Blouse pattern that I made into a tunic. The changes for this pattern were extremely easy. I lengthened the blouse by about 12″ by extending the side seams and measuring down 12″ to mark a longer hem, and instead of cutting the back gathered piece from the pattern, I cut a rectangular fabric panel three times wider than the finished width of the back yoke (that is, three times wider than the center back piece that the gathering fits to once it’s been gathered). I smocked this panel and sewed it to the upper back panel instead of the original gathered panel. Otherwise, the rest of the pattern was constructed as written in the instructions. For this tunic I used a black handkerchief linen from Gray Line Linen here in New York. It’s a bit tricky to photograph black smocking on black linen; thus, the reddish appearance in the above photo, which it isn’t in real life. It was even trickier to smock black on black, believe me! I worked on this at night, in the winter, and there was quite a bit of un-smocking that happened in the process when I discovered I had missed a pleat here or there along the way. Once you miss a pleat it throws off the entire pattern, so I would recommend either smocking by day or smocking on a lighter color if you’d like to avoid these frustrations. I’m sure it helps to be a more experienced smocker, too. This tunic was inspired by this beautiful smocked jacket that’s been on my Pinterest boards for quite a while. I think for the next one I’ll raise the seam a bit so the smocking is higher on my back. In fact, for my next one (and there will be a next one, I’m so pleased with how this turned out!) I plan to smock neon pink on natural flax. That ought to be easy to see, right? wow, gorgeous work, liesl! this looks really wonderful to wear. This is stunning, just stunning. I’m really getting excited by all your talk of smocking. Im going to have to try. Love it!!!! It’s gorgeous, instructions or tutorial or something? please! Oh man, I love this tunic! It’s so sophisticated. Great job. This is lovely and I can’t stop thinking about it! I’ve been smocking for my toddler daughter but would love to smock something grown up for myself! Did you use a pleater? Beautiful. I used to smock years ago for my daughter and would like to do it again for my granddaughters. Can you tell me what brand and kind of pleater you are using? Perfect! You do such lovely work, Liesl! I love this! I’ve never done any smocking before. I’m curious, how long did it take you to smock this? LOVE this Liesl!! Gorgeous job. I think neon thread on a natural ground will be AMAZING…can’t wait to see it.